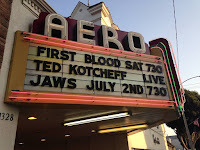 The American Cinematheque's Aero Theatre hosted a retrospective of writer and director Ted Kotcheff, concluding with 1982's classic First Blood. While Sylvester Stallone's John Rambo would go on to be remembered for the muscles, red head band, machine guns and mayhem, it's easy to forget just how solid First Blood is. Based on David Morrell's novel, the film takes place in Hope, a small northwestern town surrounded by mountains and forest. Vietnam veteran John Rambo comes to town looking for an old friend but gets harassed by local police chief Teasle (Brian Dennehy). After being mistreated by an overzealous deputy, Rambo escapes and soon a manhunt and war you won't believe besieges Hope. 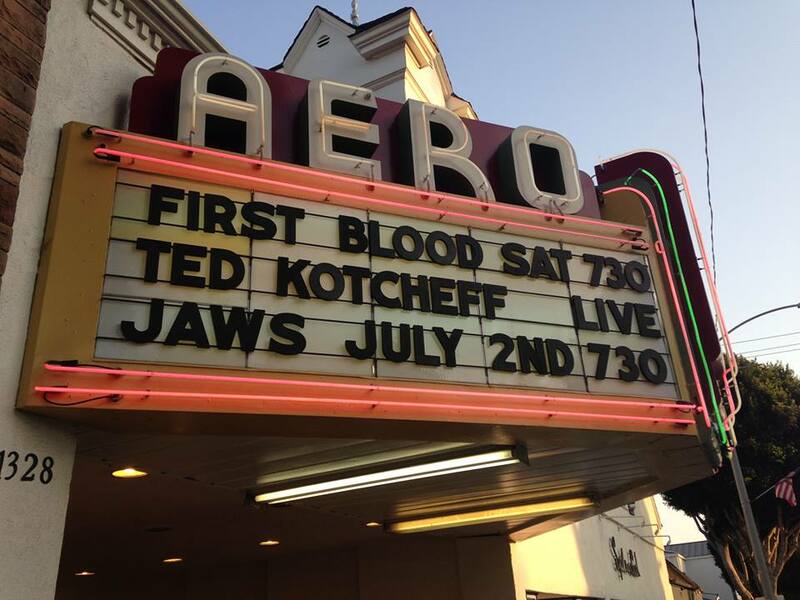 I've always defended First Blood as a drama as that's exactly what it is. There's some great action in it but it's not simply an action film. Watching it on the big screen a few thoughts ran though my head. First off, the production is beautiful. In an age when a film can arguably be deemed "good" by the fact it was shot in nature and was a hard shoot, First Blood highlights British Columbia's majestic beauty as well as Mother Nature's harsh conditions. I mean Leo got to wear a giant bear rug while he was in the snow and water but here's Stallone in jeans and a tank top in the cold, riding a motorcycle, climbing mountain faces and running through frigid water. Second, this was my first time viewing the film on the big screen and the character parts really stood out. Teasle isn't a bad guy per se, he's just trying to protect his town, gets in over his head, messes up but now can't stand back and has to go all in. His deputies played by the likes of Jack Starett, Chris Mulkey and David Caruso add another layer of humanity and surprisingly effective light comedy to the shebang. 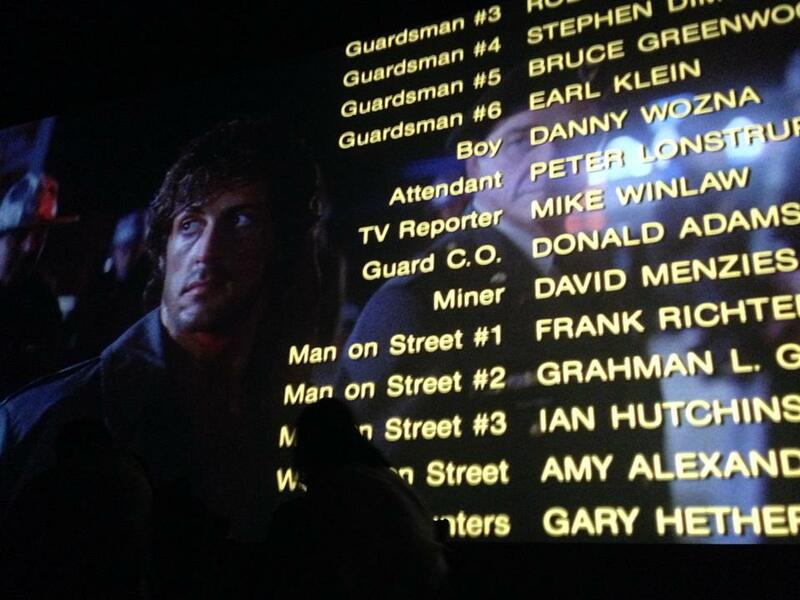 Third, Stallone is and always has been an excellent actor. I didn't realize he only speaks in about three sections of the film, each of them haunting and sincere. His end monologue about losing his friends in Vietnam and coming home to a country that rejected him makes you want to shed a tear while applauding the performance. Like Spartacus or The Great Escape, I don't find the ending sad as there's beauty in the struggle of personal glory, even if that means sacrifice. - Grew up a musician and compares all art to music. Generally aims for sonata where everything builds up and climaxes into a big finish. - Warner Brothers hired him to work on the project, went off and rewrote in 3 months then WB said there was no audience for Vietnam movies. - Kotcheff was very vocal about how poorly Vietnam vets were treated. They didn't ask to go, they were drafted. Whereas World War II and Korean War veterans were hailed as conquering heroes, Vietnam vets were protested, spit on and called baby killers upon return. - Into the 1980's, 300 Vietnam Veterans committed suicide a month. - One story of a young man who did his two years and on his penultimate day of duty, base attacked, he was only survivor and then sent home next day. No time to readjust or deal with emotional trauma. 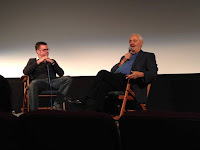 - Knew producers Andrew Vajna and Mario Kassar causally and when pair kick started Carolco, asked Kotcheff what he wanted to direct, who said First Blood. Producers spent a year getting the rights from Warner Brothers. - Stallone was always first choice even though the Rocky star had suffered failure after failure outside of the boxing franchise. But Kotcheff liked his inner and outer strength and knew he'd do a good job. - Went to see Kirk Douglas in San Francisco where the acting legend was doing a play with Burt Lancaster. Douglas loved the script and reported to set. But once there, wanted multiple script changes that Kotcheff and crew tried to appease but ultimately gave him a final script. Douglas soon took a flight back to Los Angeles and Richard Crenna was brought in over a weekend. - Enormous respect for Sylvester, who impacted two major parts of the story and character. One was having Rambo not kill any of the lesser trained weekend warriors and second, not dying at the end after having character go through so much and show death being only way out. - Dubbed the film a "suicide mission", as when Rambo is on the bridge, he turns back as he has nothing to lose, no friends left and going head on with the Sheriff. - No reservations on doing Uncommon Valor as next film and revisiting Vietnam War. Says veterans groups have thanked him profusely for making the films. - Considered having Rambo be silent through film but realized he needed to speak at key moments. - Loved composer Jerry Goldsmith and did several films together. - Stallone was being paid millions and Kotcheff made him earn it by dumping live rats on him. It was a great night and gave me a deeper appreciation of the film, Stallone, Kotcheff, the Vietnam War and it's veterans who went through so much for so little acknowledgement.